Molecular testing in anatomic pathology is becoming increa-singly important, and molecular assays are used both diagnostically and prognostically, particularly in the workup of neoplasia and for identification or subclassification for certain infectious processes. Fresh and frozen tissues are the optimal source of DNA and RNA to serve as the template for targeted molecular analysis; however, archival formalin-fixed, paraffin-embedded tissue is a frequently used alternative source of DNA for clinical testing. Paraffin-embedded tissue is especially critical as a source of nucleic acid when pathological evaluation renders an unexpected diagnosis, and it also provides the advantage of allowing for archival analysis with correlation to outcome. Molecular analysis can be performed at different levels of resolution, from the whole chromosome down to the specific nucleotide sequence. At the chromosomal level, classical cytogenetics discerns chromosome structure and number and can detect many major translocations and deletions. This technique requires fresh cells that are capable of entering into cell division. The cells are arrested in metaphase so that the chromosomes can be visualized individually for analysis. 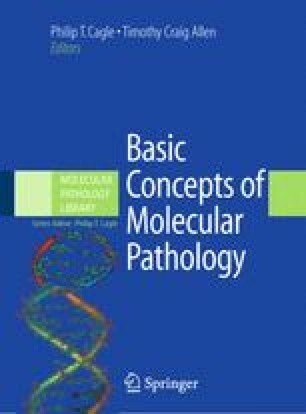 A newer technique that can be combined with classical cytogenetics is spectral karyotyping (SKY). For this specialized analysis, the metaphase chromosomes are subjected to fluorescent in situ hybridization with specific probes that are labeled with combinations of five different fluorescent tags. The result involves the “painting” of each chromosome with a unique fluorescent signal that can be differentiated with the assistance of computer detection system. This technique allows for resolution of complex karyotypes.